A revolver sits on a desk. Its presence there takes a moment to register, since the room has such a high ceiling and the wall behind the desk (which dominates the photograph you’re looking at) is bare but for a clock and a small image of a saint. Something strange is going on here - revolver? saint? - the strangest thing of all being that the juxtaposition seems almost normal. 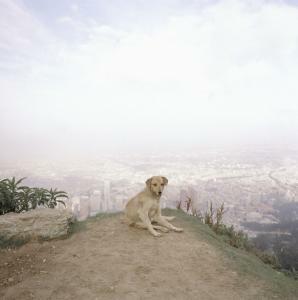 This is the most remarkable aspect of “Dog Days Bogotá by Alec Soth,’’ the exhibition of which the photograph is a part. Soth manages to make the Colombian city seem so familiar in its strangeness, and vice versa. The show runs at the Massachusetts College of Art and Design’s Stephen D. Paine Gallery through Nov. 28. There is indeed a balance of hardness and beauty in these 32 good-sized color photographs (they’re either 15 inches square or 20 inches square). Maybe that balance could even be written as an equation: hardness + beauty = matter-of-fact oddity. A mannequin wears a surgical mask. A group of policemen go sightseeing. Another policeman plays the clarinet. A turkey sits outdoors on an armchair. A lamp has a Donald Duck base. That the photographs are all untitled adds to the feeling of slight dislocation. Their air of understated oddity extends even to urban anxiety. Although there are images of menace here - barbed wire, soldiers, that revolver - they seem subdued and gentled somehow. Glass shards embedded in the top of a wall bespeak fear and the presence of crime. Yet until you get up close, they rather dreamily resemble a skyline seen from afar. The tropical air and light, thick with damp, soften and slow what the eye takes in. That’s one reason these are not lively pictures. They possess an almost palpable stillness. There’s no hubbub or sense of metropolitan teem. Another reason is Soth’s unwillingness to inflect them. He knows he’s an outsider, a newcomer, just taking things in: observing, not judging. Soth’s Bogotá is clearly a foreign place. Yet like most foreign places in this multinational age, it’s far from being altogether exotic: clearly elsewhere, yet speckled with familiarity. What attracts Soth is life, rather than liveliness. Almost all these pictures have living creatures in them: people, of course, but also dogs (lots of dogs), a rabbit, that turkey. That means what may be the most memorable image in the show is also the least typical. A circle of wire hangs coiled on a whitewashed wall. That’s it: bareness barely interrupted, starkness exalted. Geometry meets metallurgy, with ravishing results. Who knew an entrance to Plato’s cave could be found in Bogotá? Mark Feeney can be reached at mfeeney@globe.com.